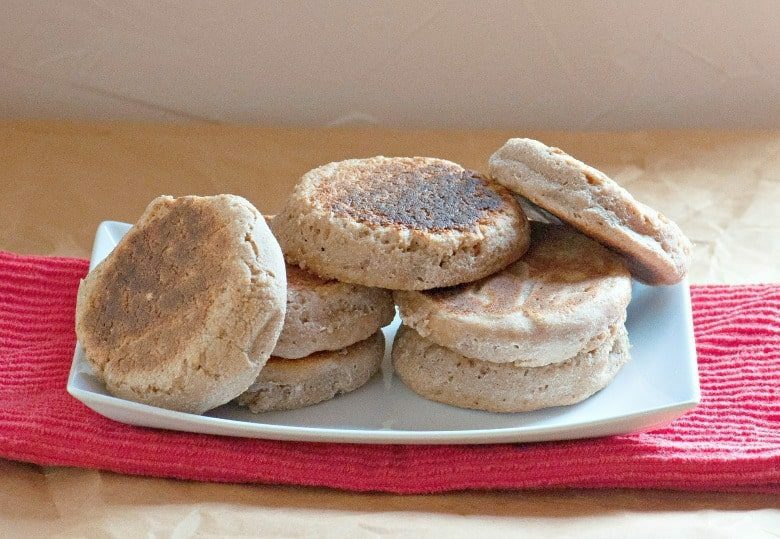 This Sourdough English Muffins Recipe is not only easy but makes delicious muffins. Be sure to have plenty of grass-fed butter and honey on hand! I am definitely on a sourdough kick! Not only is it fun to experiment but the sourdough breads just taste so good! I am sure it has nothing to do with being off grains for almost 2 years! I have experienced such life changing health benefits from the GAPS diet but it is time to begin adding foods back into my diet. And, I am really enjoying sourdough! My first addition was non-gluten grains and now sourdough breads. After the Sourdough Bread Bowls and Sourdough Pancakes came Sourdough English Muffins and, they were met by just as much approval. 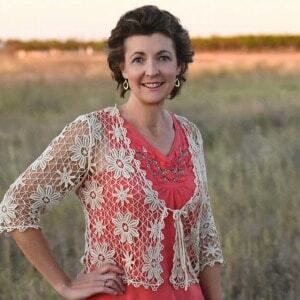 With 7 children still at home, I am very blessed that I don’t have picky eaters. Can you imagine if I had to fix 7 different plates at each meal? But, even though they will eat almost anything, they do have opinions. And, when asked, they will tell me if they think something does not taste good. 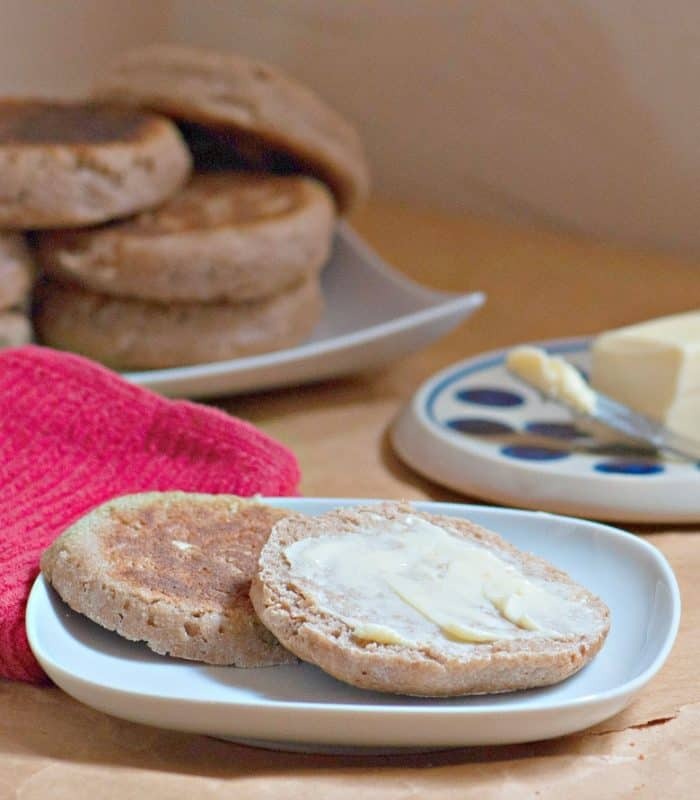 There were no complaints at all with the Sourdough English Muffins – only compliments! The only problem was that I had not made enough for everyone to have seconds – I will not make that mistake again! 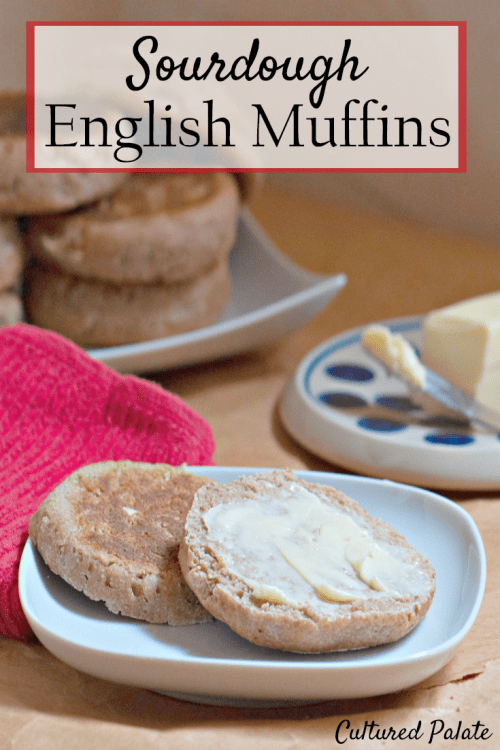 For me, English muffins are reminiscent of my childhood – and poached eggs. My mother would poach eggs and place them on sliced, buttered and toasted English muffins. When a soft poached egg is placed on top of an English muffin, magic happens as you begin to eat. With the first cut into the egg, the soft white and yolk ooze out, coating and soaking into the English muffin mixing the flavors into the most heavenly taste! If you don’t like soggy, gooey bread, you probably will not like soft poached eggs on your muffins so forget what you just read and skip to the part about serving them with lots of grass-fed butter! Unfortunately, I have not found an egg poacher large enough for my family. However, we do fry eggs and sunny-side up eggs (or “snot-on-top” as some call them) are also delicious on sourdough English muffins! I wonder if they make a 12 – 18 cup egg poacher???? Whether you are serving sourdough English muffins with eggs or not, be sure to have plenty of grass fed butter nearby. And, don’t forget the honey or cream cheese or jam…. 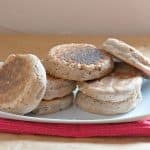 If you’ve tried these Sourdough English Muffins or any other recipe on Cultured Palate please take a minute to rate the recipe and leave a comment letting me know how you liked it. I love hearing from you! You can also FOLLOW ME on PINTEREST, FACEBOOK, INSTAGRAM, YouTube and TWITTER. I love the flavor the sourdough lends to these English muffins. Place sourdough starter in mixing bowl and add kefir (or milk). Cover with saran wrap and allow the dough to proof until it doubles - this takes 12 - 18 hours. After the dough has proofed, add sea salt, baking soda and honey. Mix thoroughly. Knead the dough on a lightly floured counter for a few minutes. Roll the dough out to 1 inch thickness and cut into 2 - 2 1/2 inch muffins. Place muffins on a baking sheet, cover and allow to rest for 1 hour. Heat skillet to medium on the stove top. Working with a few muffins at a time, cook on each side for about 5 minutes and flip. Keep uneaten muffins (if there are any!) in the refrigerator or freezer. Joyce, I have never tried it but if you do, please let me know – that would be a good tip to add to the recipe. I think if I were going to try it, I would start at 350F for about 10 minutes and check them. You don’t want them to dry out.